Recent research reveals that community water fluoridation benefits adults as well as children. While research into the effects of fluoridation in adults started earlier than for children, early studies suffered from a lack of information on effects of socioeconomic status and other confounding factors. Recent studies with adults have been more robust but there is still some confusion – especially since the often cited recent Cochrane systematic survey of the scientific literature on fluoridation was unable to draw conclusions on this because of the strict inclusion criteria used was not suitable. This new study checked the effects of lifetime access to fluoridation on the dental health of adults from a city in southern Brazil. It concluded that lifetime access to community water fluoridation is associated with lower tooth decay in adults. The researchers adjusted their data for well-known confounders such as socioeconomic status, the pattern of dental visiting, smoking, educational attainment, income, and age. Use of fluoridated toothpaste was common for all subjects so could not explain the results. The final data, adjusted for confounders, showed a greater protection with a longer exposure to fluoridated water. 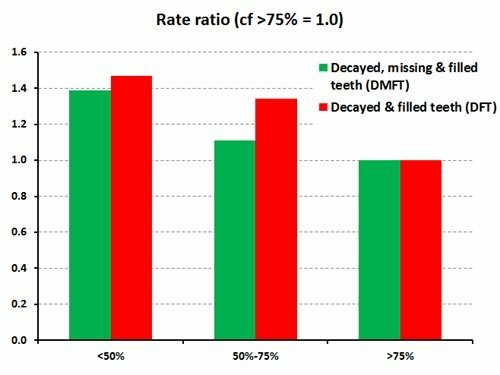 The figure below shows this data for DMFT (decayed, missing and filled teeth) and DFT (decayed and filled teeth). The use of both measures helps to accommodate the fact that some teeth are missing for reasons other than decay. The data is present as ratios of DMFT and DFT for the shorter exposure periods ( <50% and 50%-75%) to the values of DMFT and DFT for exposures of >75%. So, once again a study showing the benefits of community water fluoridation. this time for adults with long time exposure to fluoridation. Fluoride is a byproduct of aluminum that is a neurotoxin.Lack of hygiene, selling foods to poor people and malnutrition causes tooth decay.Look back in history. Annette, what does your comment “Fluoride is a byproduct of aluminum” even mean? Fluoride is a hydrated anion that occurs in water – usually naturally. Aluminum is a solid metallic element. The protective role of fluoride for teeth is well established scientifically. Sure, it is not the only factor for oral health – but it does play a beneficial role.